The perfect book for every child! At Hinkler, we love kids’ books! Our children’s books are world-wide favourites because they are informative, beautiful, innovative, and most of all, entertaining and fun. We work hard to make sure our books give kids a great start and keep them reading, discovering and enjoying books for their entire childhood, and beyond. We’re also passionate about making sure that every child can enjoy our books, and that’s why we try to make sure our kids’ books are accessible and affordable for every family. We understand how important books are for a child’s development, but we also know that books are amazingly, awesomely fun! Maybe you’re looking for something to keep the kids entertained? Check our Hinkler’s huge range of a colouring and activity books! How about helping children learn? Hinkler has a huge range of engrossing, fun books to encourage learning and development! Are your kids looking for new hobbies and interests? Discover Hinkler’s craft and activity kits, how-to-draw titles and origami books! And for kids of all ages who love to read, we’ve got good quality fiction, joke books to make everyone laugh, beautiful collections of stories, and more! Hinkler’s huge range of kids’ books also includes titles featuring popular licensed characters. There’s something for every age, from Thomas and Friends, Disney and Paw Patrol to Barbie and Shopkins. Our licensed range comes in a variety of innovative formats, including invisible ink books, pencil and eraser sets, floor puzzles, posters and wall charts, as well as classic colouring books, board books and activity packs. Hinkler’s children’s books include engrossing fiction titles ranging from board books to picture books to chapter books, entertaining early-learning books, creative colour and activity titles, awesome craft kits, and loads more, all in a range of exciting, fabulous formats! Whether your child is a preschooler, tweenager or teen, Hinkler has a book for every child, regardless of age, interest and reading level. Teaching kids with fun learning books! Hinkler’s early learning board books and novelty books are designed to build and encourage children’s development. Preschoolers love our fun, bright titles filled with colourful photos and gorgeous illustrations, and parents love seeing their little ones learning words and concepts, building their numeracy, developing new skills and discovering their world! 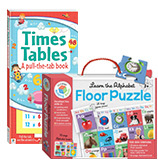 The early learning range also includes flashcards, sound books, cloth books, wipe-clean books, bath books, tell-the-time books, times tables, and more! 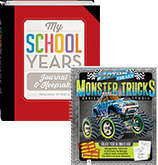 The bestselling School Zone range features educational workbooks and flashcards from preschool and up. This fun, colourfully illustrated series make home learning fun and easy. School Zone is Australia’s leader in home-learning titles and includes a range of books to get kids NAPLAN-ready. Our colour and activity books are perfect for kids of all ages, with drawing, colouring, sticker, invisible ink and paper doll titles for all ages. Plus, many come with their own pencils, markers or erasers! Create your own masterpieces with Hinkler’s exciting range of instructional drawing books: there’s a title for any skill level. Hinkler’s craft kits will keep young minds and hands busy. There’s a huge range of subjects, from origami, paper planes and dress-up masks to sewing, rock painting, nail art, clay charms, and more, all containing everything you need to start getting crafty right away! Fabulous fiction for all ages! Discover Hinkler’s fiction books for kids of all ages! 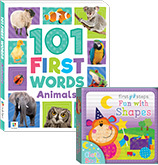 Our fiction list includes fun novelty board books for little ones, beautifully illustrated picture books for emerging readers and chapter books for confident, independent readers. Our fiction books will entertain as well as encourage children to discover more about themselves and the world.